Organic allspice has a strong aroma, and tastes like a complex earthy blend of cinnamon cloves and nutmeg. American - In the US, commercial food manufacturers use allspice to flavor ketchup, pickles and sausages. Caribbean - A cornerstone to Caribbean cuisine, it is the premier flavor in Jamaican jerk seasoning, stews, and curries. Mexican - You find allspice in adobos and pipians (seed-based sauces of central and southern Mexico), and in many dishes from the Yucatan peninsula. 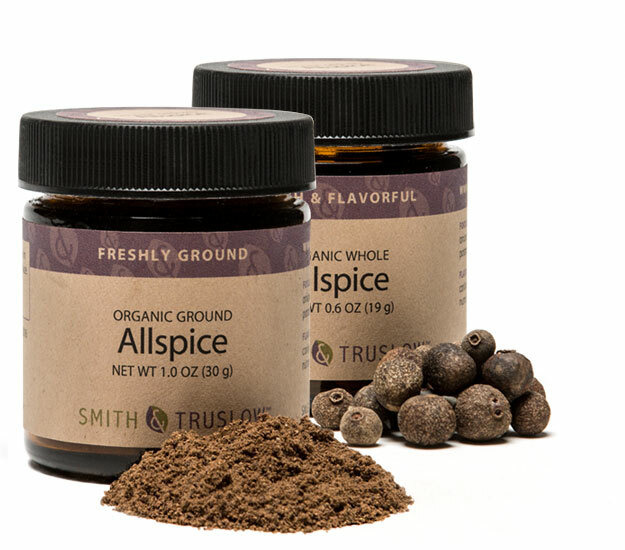 Allspice is the dried fruit of the P. dioica tree that is native to Greater Antilles, Southern Mexico and Central America. Because of the height of the tree, 20-50 feet, allspice berries are frequently hand harvested. The green fruit of the tree is picked and then dried in the sun until it turns brown. Allspice is the only spice that is grown exclusively in the western hemisphere.